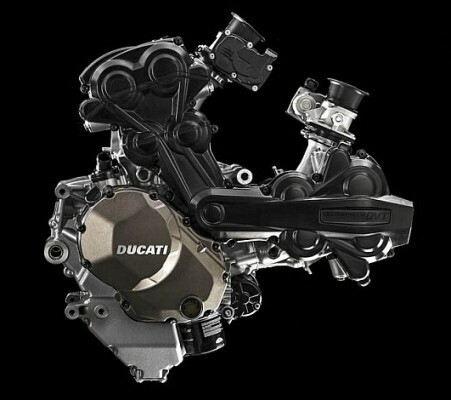 Ducati unveils first motorcycle engine with variable valve timing on both inlet and exhaust sides. Its called Ducati Testastretta DVT (Desmodromic Variable Timing), the new two-cylinder will debut in the third generation of the Multistrada 1200. This variable distribution system can work continuously adjust the valves to act independently on the intake camshaft and the exhaust. The system optimizes engine performance throughout the entire rev range and in all operating conditions to ensure maximum power, smoother delivery, high torque and reduce consumption by 8%. To independently adjust the phase of the camshaft which controls the intake valves and also adjusting the phase of the exhaust valves, Ducati Testastretta DVT engine optimizes performance at high speeds for maximum power, while in medium and low range ensures smooth, fluid power delivery and maximum torque. This means that the engine adapts its characteristics as a function of revolutions, while undertakes to comply with emissions standards. This system is more sophisticated than that employed in their Honda VFR800F (VTEC), whereby 6,500 rpm work only two valves of each cylinder head and over the four. Instead, the crossing angle of Ducati Testastretta DVT engine valve can change constantly.